The adorable little fox named Rex is plucked from his home world by a mysterious spaceship and transported to the arcane world of Edernia, where he meets Aven, an enigmatic biomorph with a flying saucer. Follow his epic journey as he travels through outer-worldly landscapes, faces strange perils, and makes surprising encounters. 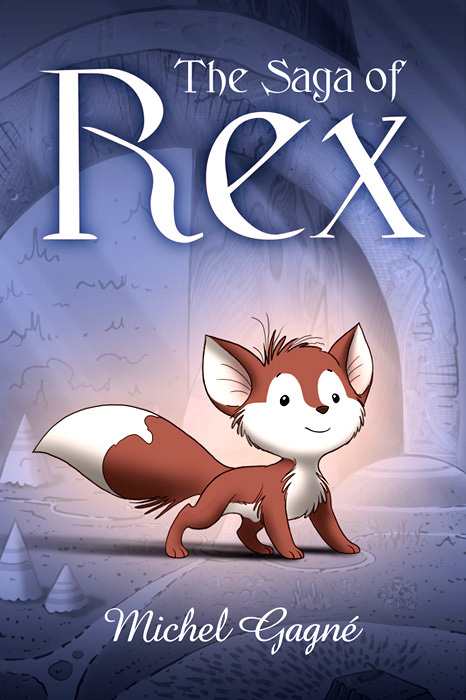 A story that is in turn adventurous, heroic, tragic, romantic, and wonderfully surprising, The Saga of Rex perfectly captures a vision of whimsy and wonder that will delight young and old. 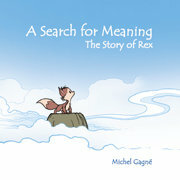 Michel Gagné's lush and colorful illustrations, combined with cinematic storytelling, have earned The Saga of Rex a worldwide following. For the first time, the complete and unabridged tale originally serialized over a period of seven years in the award-winning anthology, Flight, is now available in all its glory in a single volume. Print Size: 10.5" x 7"
Image Size: 8" x 5.6"
Print Size: 7" x 10.5"
Image Size: 4.5" x 8.5"
"...a sensitive and intriguing graphic novel for people who like a little enigma in what they read." "It's epic! It's deep! It's fundamental! And yet, there's something simple, warm and personal about it that goes straight to that little spot in your heart that makes you smile like a child again." "The free-floating, heroic whimsy of the story arrives at a sweet ending, but the real experience is in swooping through Gagné’s deliriously gorgeous, silent panels and breathtaking planetary vistas." "...an absolute tour de force... The set pieces are muscular in both the visual and storytelling sense. The fluidity, sense of play, and imagination exhibited by Gagne get Flight off to a champagne-cork-popping start.."
"Tons of energy, great flow to the art, and really unique monster designs." "...a touching story about sacrifice, gratitude, and love." "Mysterious, surreal, pretty and disturbing all at once..."
"...a piece of virtuoso art in both the color and storytelling." "...a silent story of mind-blowing proportions [...] is in turn adventurous, heroic, tragic and wonderfully surprising. [Gagné's] art perfectly captures a vision of whimsy and wonder. This is what comics are about, folks." 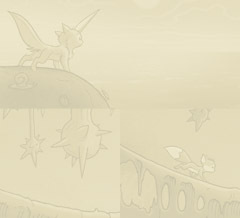 Feel free to use one of these banners to link to this page. Go to the official Flight website.